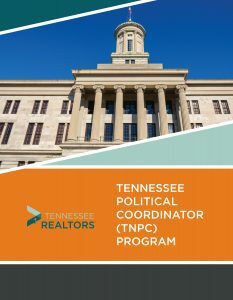 The position of a Tennessee Political Coordinator (TNPC) plays a key role in making sure our state legislators are informed on issues that matter to Tennessee REALTORS®. TNPCs serve as advocates on behalf of all Tennessee REALTORS® and ensure that legislators understand issues and concerns regarding the real estate industry and property rights. Through fostering a great relationship with legislator(s), TNPCs spearhead communication, ensuring the voices of Tennessee REALTORS® are heard and understood. Before applying to be a 2019-2020 TNPC, please look over the Key Responsibilities. Advocate on behalf of Tennessee REALTORS®, setting aside all personal views and opinions and working toward the success of the REALTORS® agenda. Build, grow, and maintain great relationship(s) with assigned legislator(s). Contact assigned legislator(s) and complete a field report at least once per quarter. This is a total of four times a year. Respond to all Calls for Action, and encourage others to respond as well. Lead the meeting with your legislator(s) and attend the annual Tennessee REALTOR® Day on the Hill.